This world can be terribly false and so much of that is because of fear. Fear of being real, fear that the people we actually are are somehow lacking or not good enough. 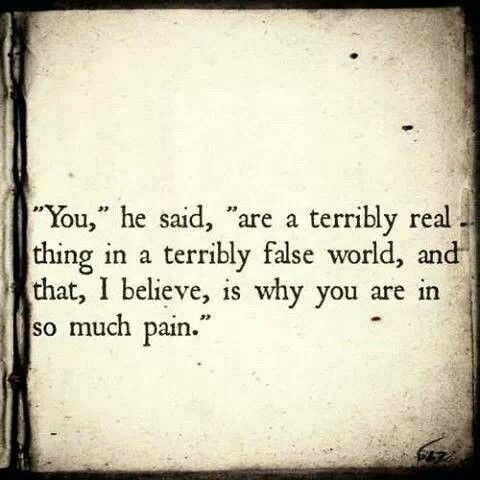 This is why we so often find ourselves in pain. Afraid to say “I am not perfect. This is who I am. I am flawed.” we pretend and pretend until we are blue in the face. Somethings who we are is hurting. Sometimes who we are struggles to get up in the morning or to find the good in the world. And we are so very afraid of admitting this we cause ourselves much more pain. Trying to pretend everything is ‘fine’. Trying to keep our masks straight so no-one sees our tears or our worries or our insecurities. It’s time to put the masks down. It’s time to recognise that life can be hard, sometimes for no obvious reason. Sometimes we just feel rubbish. And that’s ok. Really it is. It’s time we were free to be REAL, both in our pain and in our happiness. I love that quote. I think it is sometimes so difficult to be open, honest, and show your true self in a world that has a tendency to encourage dishonesty. As I get older, I find it harder and harder to let people in and express my honest thoughts. I’ve recently began blogging myself just to have a space where I can express my truest self freely. Hope we can become fans of each other;s blogs! I understand exactly what you mean! We’re faced with so many competing expectations it’s hard sometimes to take a step back and just be. It sounds like we started blogging for very similar reasons – leave a link, I’d love to have a nosy at your blog. https://thisismeithink92.wordpress.com/ there’s mine! Thanks for the curiosity!